Region: This beetle is common in the northern United States, especially in the West, and in the southern region of Canada. Similar species can be found throughout all of North America. Life cycle: This beetle produces one generation per year and the adults hibernate in garden debris. 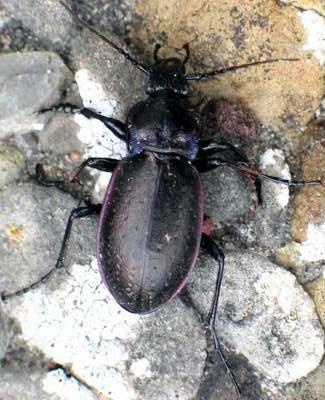 Physical Description: This nocturnal beetle is black with violet appearing on the outer edges of the wing covers. It is heavily armored with long legs and is one inch long. The eggs are laid in the soil and the larva is white to light brown with a large head. Feeding characteristics: The adult beetle is a FIERCE predator of many kinds of slugs and snails.